Did you know that according to the United States Bureau of Labor Statistics that there are currently over 119,000 working Flight Attendants (FA)? The highest number of Flight Attendants reside in the state of Texas -- 16, 310 to be exact. Flight Attendants help ensure the safety and comfort of passengers on airline flights. Their important job goes beyond serving food and drinks. Most of their responsibilities are mandated by federal law. Flight attendants instruct passengers on safety procedures, like how and when to use the plane’s seat belts, and how to use oxygen masks and exit the plane in an emergency. Before each flight, attendants make sure all necessary equipment and supplies are available on board. Flight attendants may also perform first aid and deal with any other problem that occurs during a flight. 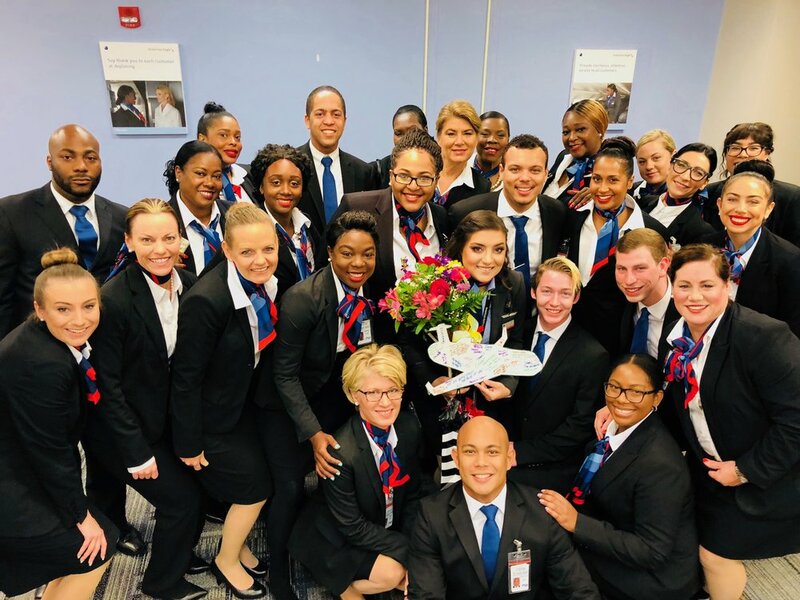 I'm so impressed with this career field that I made it my mission to seek out a new Flight Attendant to interview because I wanted to know what it was like for them to choose this career and what that very first flight (after training) was like. That's where Nerisa of Burlington, Kentucky comes in. I met Nerisa by chance via social media and was thrilled when I had learned that she had recently embarked on her career as a Flight Attendant. I felt even more honored that she accepted my invitation to be interviewed for my blog. I was finally getting the opportunity (firsthand) to learn about her experiences becoming a new Flight Attendant. What was the most difficult part about Flight Attendant training? Just the thought of not passing the training. It was nerve wrecking! 'Emergency Procedures' were really the hardest sections, so much to memorize in such a short time. I loved the shouting part of it, reminded me of cheerleading days. It took a lot of practice. Describe your very first flight in your new role as a Flight Attendant after training? During my very first flight I was super nervous, I worked for the FWD/1st Class. The person that was scheduled to work with me didn't show up, I ended up working with a really nice guy. My first class passengers were great. I learned so much during that trip, the other FA poured out a wealth of knowledge. I now look forward to going to work. What’s the wildest thing that you have experienced in flight with a passenger? Hahaha, one night we were flying and I was working the AFT/main cabin. During the flight, a lady approached me stating that she would like to speak with me privately. She expressed her concerned, that a young man was trying to open the overwing exit. I noticed he had changed his seat to the exit row without permission; it wasn't a full flight. She was like he's fidgeting and using his cell phone. I told her thanks for the information. I was scared, but I kept my composure. I kept saying in my head I'm not ready to die. I brought it to the attention of the other FA and he said: "Just go ahead and brief him, it may not be anything." I briefed him and then realized he had asked for a blanket earlier. He was just cold, hence the fidgeting. He wasn't trying to open the exit windows. It was more of racial profiling. What do you like about the brand “FlightsInStilettos”? Everything!!!! It's so classy and believe me, one of my favorite words are 'Stilettos'. I love what the brand stands for; bringing back style into traveling. I remember in 2006, that's all I was about when traveling. What’s the best piece of advice you’d offer to someone wanting a career as a Flight Attendant? Make sure that this is what you want. You have to do your research, research the company you want to work for, its pay, the benefits, where they are based, etc. You have to love flying, this is more than a job it's a lifestyle. The 1st year is the toughest when it comes to your paycheck. After I completed this interview I actually felt enlightened about this career field. What resonated most is the story about the passenger thinking that a passenger who was simply cold was up to something much more nefarious. We encourage American to say something if they see something, but it must be very hard when you're NOT seeing what you think that you are. Nerisa, as a new FA, experienced fear, but I'm so glad that she could recall her previous interaction with the passenger in question and as a result could connect the dots. Before that happened, I know that this was a frightening time for this new FA. Without a doubt, Nerisa has grit, dedication, and perseverance -- she will excel in this career. Remember her face, because she may be serving you on your very next flight. And as you see -- this Flight Diva -- takes FlightsInStilettos!